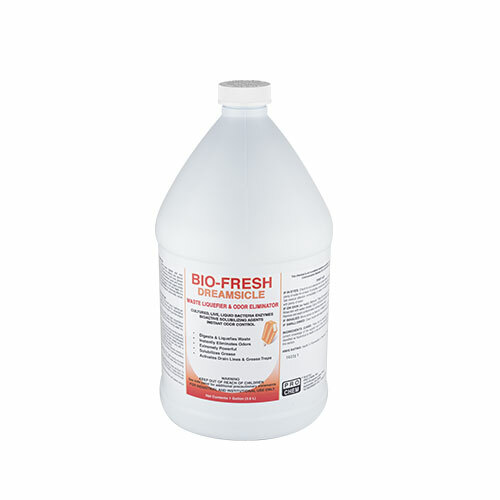 BIO-FRESH | Pro Chem, Inc.
BIO-FRESH is a ready-to-use, liquid bacteria waste digester and odor counteractant. Formulated with a blend of cultured live bacteria and special bioactive solubilizing agents, this product is highly effective in drain lines, grease traps, lift stations, sewage treatment systems, water treatment plants and septic tanks. Used as directed, this product will eat away grease and other organic waste that line the pipes, creating odors and slow-flowing drains. It will also digest uric salts on floor tiles around toilets and urinals. BIO-FRESH is an extremely effective odor eliminating solution in garbage and waste receptacles, porta-toilets, carpet, and other hard surfaces. Waste Treatment Plant: Use 3 ppm, for the first 7 days, 2 ppm for the next 7 days, then 1 ppm daily for preventative maintenance. Application should be at furthest point in the plant to give the longest retention period. Grease Traps: Have trap pumped before beginning treatment. Add 1 quart per 25 cu ft. capacity, then begin preventative maintenance regimen. End of business, add a pint of solution that is 50% water and 50% BIO-FRESH to each drain leading to the trap. Avoid running water into the drain overnight. Drain Lines: It is important to establish a bacteria colony during the first month. Pour 8 ounces per inch of diameter of pipe, directly into the drain lines at the end of the day or the lowest possible use period. Begin this process on the first/lowest floor, moving up one floor each day until the top floor has been treated and the entire system is moving freely. Maintain by treating the top floor only with a maintenance dose of 2 oz. per inch of diameter twice weekly. Drains: For slow drains, pour a total of 8 oz. per inch of diameter directly in drain, then maintain by pouring 2 oz. per inch of diameter of pipe twice weekly directly in drain. Cement Vault Toilets and Porta-Toilets: Initial dose, pour 1 gallon directly into toilet and cover solids with water to aid digestion, add 1 pint each week while insuring the waste surface is kept moist. Septic Tanks: Pour 1 pint per 25 cubic ft. capacity directly in toilet and flush. To maintain, pour 8 oz. per cubic ft. directly in toilet and flush. If septic tank has become clogged and odorous, add 1 quart of product directly to the tank through manhole. Odor Control: Directly spray onto problem surfaces and fibers until soaked using a trigger sprayer. Allow to air-dry.